A recent trip to Phoenix Arizona provided an opportunity for my wife and I to check out the Burrowing Owls at Zanjero Park. This was one of several places that we birded, and future posts will display our sightings in those other locations. The park is an unassuming place with about a mile of horse trails and a walking/bicycling path as well. It has been made into habitat for Burrowing Owls by installing pipes in the ground (along the walking/bicycling trail) that serve as burrows for the owls. Since the owls are diurnal, they are visible throughout the day. According to the locals, at least a few owls can typically be seen throughout the day. We were there in the early afternoon and saw two that were lounging in front of their burrows. There appear to be at least 50 burrows, but I do not know how many are occupied. We viewed these owls from about 15 feet away and they did not seem to be disturbed by our presence. These owls are small, with a total height of 9.5 inches but they were kind of sitting down so they were probably only about 7 inches tall. The noonish light was probably not ideal, but we thoroughly enjoyed being able to see and photograph them. The entrance sign to this park which sits right next to the 202 Loop Highway. One of the Burrowing Owls standing in front of the artificial burrows. There were probably 50 or so burrows and they were not far apart. Some were only 4-5 feet apart. Photo by Robert Oberfelder. The “I’m not worried” pose. Photo by Robert Oberfelder. The “I’ve got my eye on you” pose. Photo by Robert Oberfelder. The “You will blink first” pose. Photo by Robert Oberfelder. The “I see you” pose. Photo by Robert Oberfelder. The “You don’t see me, I am invisible pose.” The legs and chest are facing forward, but the head is turned 180 degrees around. Photo by Robert Oberfelder. On March 5, I was out of bed by 4 a.m. to get ready for an early flight, and it was 36 degrees outside! It may not feel much like spring these days, but a few days of low temperatures does not dissuade our local birds. They are tuned to multiple factors, and it seems clear that daylength is one that sends a strong if not the strongest signal that it is time to get the house ready – the kids are coming. For the past 2 weeks, folks have been emailing or otherwise telling me about their observations of a couple species that are indeed conducting nest building activities – the Red-shouldered Hawk, and the Brown-headed Nuthatch. The former is our Bird of the Year, and the latter of course has been a focus for several chapters selling “nuthatch” nest boxes (Wake Audubon has sold many hundreds!). In a “normal” year around the Piedmont of NC, Red-tailed hawks begin nest building (or refurbishing last year’s nest) in mid-to-late January, which can go on for a week or two. The Red-shouldered Hawk begins 2-3 weeks later and thus this year, they are “on time” as some folks reported watching adults carrying sticks to nest locations, in mid-February. On this schedule, for those young who make it “all the way”, the Red-tails will fledge in late May, whereas the Red-shouldered’s will do so in mid-to-late June. May is a noisy month with many begging Buteo’s around town. Similarly, I received my first “Nuthatch alert” in mid-February – an adult was excavating a cavity in a dead snag in a neighbor’s yard. In addition, Wake Audubon board member and Flickr manager Bob Oberfelder found an adult excavating along the American Tobacco Trail on February 21. Once again, these birds are “on time”. Bob got some great shots of the adult tossing wood chips out of the cavity, which I include here. I’m also including a shot or two of eggs from a nest box I installed at a nearby elementary school. Another neighbor and her pre-teen daughter have been checking this and 10 other boxes I put up, for the past 2 seasons. Our small bit of data show that nuthatches can be incubating eggs from the second week of March into late-April. That is, some lay as early as mid-March, whereas others, for some reason, lay in mid-April (you may recall it takes about 10 days for a BH Nuthatch egg to hatch). Brown-headed Nuthatch eggs in nest box at AB Combs School. Photo by John Gerwin. Hopefully, you have your ‘nuthatch’ boxes up, but if not, now you know there are some late layers out there. So go ahead and put up another if you wish to. It was a beautiful, sunny Saturday, March second, out at Prairie Ridge Ecostation, and it was perfect for erecting a brand-new Deluxe 12 gourd rack with 12 Excluder gourds from the Purple Martin Conservation Association (PMCA). The sun was a welcome sight after the grey, rainy days of late. Rob and I arrived around 1:00pm to get the equipment out of the shed and down to the area next to the outdoor classroom. We took all of the parts out of the boxes and read over the instructions to make sure we understood what to do before the kids showed up. We decided to divide them into two groups: one would work on the pole and the gourd rack hardware, and the other would prep the gourds for mounting. Most of the kids showed up around 1:45pm. We sent them on a brief walk on the trails while we waited for the last scouts to arrive. Once everyone was there, we got to work. We had 5 scouts. Rob led the hardware group, and Courtney showed the other group how to prep gourds. First, we got out the non-stick cooking spray and sprayed and wiped the upper inside area of the gourds to keep wasps from hanging nests there before martins move in. After each gourd was sprayed, another scout put in a handful of pine straw as a pre-nest. After these two scouts were finished, another scout looked over their work to make sure they didn’t miss any spots or get too skimpy with the pine straw. Shortly after they finished the gourds, the pole was ready to erect. Rob and 2 scouts set the pole upright, and then all of the scouts helped to hang the gourds. We wrote numbers on each gourd for easy record-keeping. Each scout took turns at the winch handle, since everyone wanted to raise it up. After the rack was up, we hung the predator guard on the pole. It’s 4 ft from the ground to the top of the predator guard, which is the recommended distance. However, we know they have some big rat snakes out there, so the guard should be waxed, at the very least! We discussed why a predator guard was necessary with the scouts. Today, the scouts learned about teamwork, martin conservation, carefully following procedures, and quality control to assure uniformity of their work. They are all excited to come back later in the season to watch banding or to see the martins using the new rack. While we were there, a few members of the public also came up to ask us about the gourd rack, so it was a good opportunity to engage them as well. Every year hundreds of millions of birds die when they fly into unseen or reflective glass in buildings. Many of these deaths could be prevented by commonsense bird-friendly building standards. Please join us in urging your congressional representative to support the Bird-Safe Buildings Act https://act.audubon.org/onlineactions/cFKDdto0hEC6HqnxgB0y-Q2 to reduce these unnecessary bird deaths. Since 2013, over a dozen Wake Audubon Society volunteers have monitored the number of migratory birds killed locally by building collisions. Sadly, we have seen no reduction in bird deaths despite the City of Raleigh’s support for the Lights Out initiative. We need to take additional steps to make a difference for birds. Let your congressional representative know https://act.audubon.org/onlineactions/cFKDdto0hEC6HqnxgB0y-Q2 that you want them to act to protect birds. The Raleigh Christmas Bird Count in 2018 was very different from recent past years – it was relatively warm! I won’t say ‘balmy’ but compared to the below-freezing dawn temps some of us have experienced the past few years, this year felt a little, well, balmy. But it was also rather drizzly and indeed for the first 90 minutes, most of us experienced some form of light precipitation. I continued my tradition of providing a couple boxes of Krispy Kreme donuts (assorted variety), a thermos of bird-friendly coffee, for those willing to join me for one pre-dawn hour on site, to listen for any wood-be owl. To date, I have heard only one such owl in 5 or so years of this, and by the end of the hour, I am still at 1. But I always enjoy a few donuts and many many ounces of coffee. I have also enjoyed the company of a variety of other “dawn birds”. This year, my “flock” consisted of a couple Young Naturalists, a couple recent YNC graduates, some Audubon members, and a couple folks from the Museum. Our overall effort this year took the form of 19 groups, covering their respective areas. By 12:30pm, with about “half the precincts” reporting, the species list total was at 95. This is noticeably higher than years past. Some of the groups will be sending in their reports in the coming 2 weeks, and the total species number may reach 100, something that hasn’t happened on this count in many years. But it’s not just a high number that matters. Indeed, the main focus on the count is to cover the areas we do in a consistent manner. The data we collect are submitted to a national database, and this database is available to the general public. Many folks have performed a variety of analyses on these data, which span 118 years for some locations. This is a ‘big year’ for seeing some “northern” species, which are moving into the SE in large numbers this fall/winter. Pine siskins have been showing up at various feeders. We found a couple Red-breasted Nuthatches at Walnut Creek. Pine Siskin on Mid Pines Road. Photo by Bob Oberfelder. 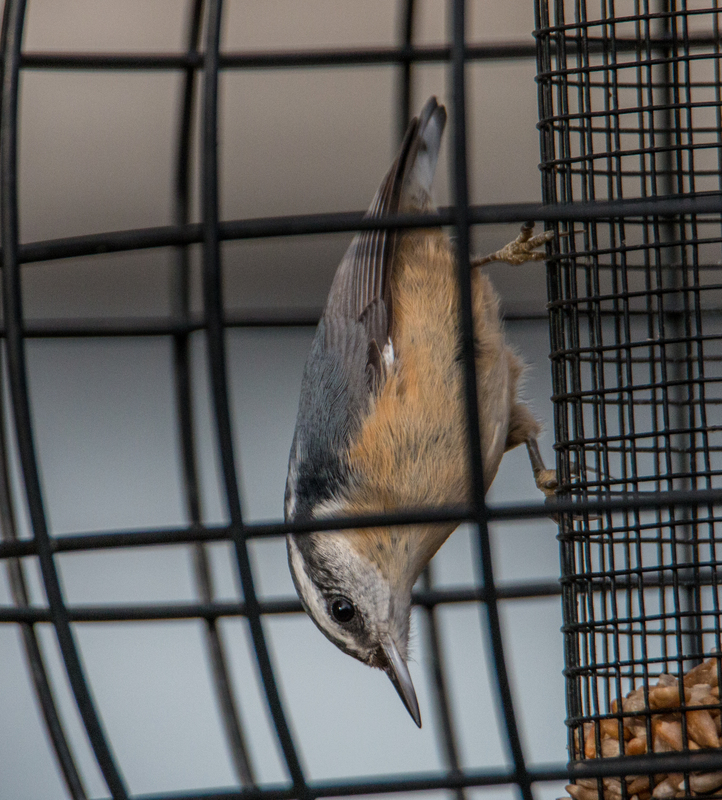 Red-breasted Nuthatch. Photo by Bob Oberfelder. Last year, we flushed an amazing Wood duck from the Garner Road pond along the Walnut Creek greenway – this year only half a dozen flew by. It’s pretty unusual to find 75 Wood ducks in such an urban setting. And some of our crew managed to flush a Gray Catbird, always rare for this count. Folks over along Swift Creek found some Rusty Blackbirds, anther good find. Rusty Blackbird at Fred Fletcher Park in Raleigh. Photo by Bob Oberfelder. A Peregrine Falcon and Merlin were seen along Mid Pines Road. A Peregrine was seen at the same spot last year, and the year before. Surely this Peregrine is a returning individual, enjoying some of the many pigeons along that stretch. Peregrine Falcon over Raleigh. Photo by John Gerwin. By 0900, the drizzle had stopped and the next few hours were nice for walking and birding. One of my favorite birding experiences of the year happened at the end of our count. A few of us wandered east along the Greenway into an adjoining neighborhood of southeast Raleigh (which is how the Greenway was planned at this section). In 20 minutes, covering about 3 blocks with normal yards and houses, but Walnut Creek nearby, we found nearly 75 individual birds of over 20 species. This was a section we have never covered before, but this year we had time. And it goes to show how interesting it can be to wander into such an area and see what you can find. Indeed, the new organizer, Brian O’Shea, and I were discussing this very topic right before the count. And that we plan to get some folks into such areas in the future and thus expand coverage. There are many wooded neighborhoods within the count circle, that are never covered. If you are interested in being one of our “urban” stealth bird counters in the future, just let us know and we will set you up. In the meantime, a big thanks to all who helped out. In the end, our Walnut Creek totals (species and individuals) were almost the same as 2017 – only a tad lower. I would have bet money that both were “a lot lower” but I would have lost. That’s in part why we do what we do. Even in a light drizzle. This way we have real data, and we don’t have to rely on Gerwin’s faulty memory. Here are photos of two other birds that were spotted. Red-shouldered Hawk. Photo by John Gerwin. Brown Creeper. Photo by Bob Oberfelder. Sunset on the Scuppernong River at Pocosin Lakes Visitor Center. 19th: Alligator River, Pea Island, and Pocosin Lakes National Wildlife Refuges; Nags Head Woods Ecological Preserve; Cape Hatteras National Seashore; Pettigrew and Jockey’s Ridge State Parks; and a few other stops. * = observed only as dead-on-road (DOR) or otherwise dead specimens. All photos by Jeff Beane. The dune-sheltered maritime forest and interdunal freshwater ponds at Nags Head Woods provide unique habitat for species like the Southern Cricket Frog, which are common on the mainland but unable to survive on most of the Outer Banks. Red-bellied Cooter at ARNWR. This species reaches the southeastern edge of its range in northeastern NC. Yellow-bellied Sliders, like these basking at Pea Island, are one reptile species that can often be seen on sunny days throughout the winter. Sunday was warm enough for this Brown Water Snake to be out basking at ARNWR. Our federal refuges provide critical wintering habitat for many waterfowl species, and they were packed in at Pea Island NWR. This view includes Bufflehead, Redhead, Northern Pintail, American Widgeon, Gadwall, American Black Duck, and Tundra Swan. Tundra Swans, like these at ARNWR, are just one of many wildlife spectacles that our large coastal refuges have to offer. This female King Eider at Pea Island was by far the rarest and most unexpected find of the trip! Canada Goose at Pea Island. This trip offered plenty of looks at “real” (i.e., migratory) Canada Geese (as opposed to introduced/behaviorally-altered resident populations). Laughing Gull on the beach at Nags Head. Downy Woodpecker, Red-bellied Woodpecker, and Northern Flicker at Alligator River NWR. Eastern Phoebe at Alligator River NWR. Female Indigo Bunting at Pocosin Lakes Visitor Center.Female Indigo Bunting at Pocosin Lakes Visitor Center. Bears! How fortunate that there are still places left for American Black Bears in our world, and the Albemarle Peninsula is one of the best. They were a focus of our trip, and the group was afforded a few good looks. A Red Wolf at Alligator River NWR was a lucky sighting! Eastern Gray Squirrel at Pocosin Lakes Visitor Center in Columbia. Birders are often more easily identified than birds. Authored by John Gerwin, trip leader. Our August Butterfly Walk began at Raulston Arboretum at 9 am on Saturday, August 5th. We had 16 participants, 11 of which of which followed us to Prairie Ridge for part 2. (for about an hour at the end). Thanks to everyone who came out. We had ~19 species including a cool one I have not seen in years, called Hayhurst’s Scallopwing. The larvae of the Scallopwing feed on Lambs Quarters, which is a common “weed”. Which is closely related to Quinoa. Another good one for the day was a Gulf Fritillary. This is a more “tropical” species that reaches the Raleigh area now almost every year. That is, early broods way down south (Florida, Georgia) grow up, lay more eggs, and the new ones sort of “drift” northward. Almost like the Monarch pattern. The larvae of this one feed on Passionflower. The Pipevine Swallowtail larvae feed on plants in the genus Aristolochia. In the mountains, this is a vine called Dutchman’s Pipe and this butterfly is really a “mountain” butterfly, where it is far more abundant. Here are photos of the Pipeline and the Black Swallowtail, both of which we saw. Red-banded Hairstreak: the larvae feed on fallen, decaying leaves of Wax Myrtle and several Sumac species. It seems no one has documented them feeding on live leaves, or rarely. Those who raise them in captivity raise them on decaying/dead leaves and some studies in nature find the same thing. On Saturday, 25 March, I led a field trip, “Ephemeral Ponds in the North Carolina Sandhills,” as a follow-up to my talk on ephemeral wetlands at the 14 March general meeting. Participating were Colleen Bockhahn, Genya Bragina, Chad Chandler, Carol Cunningham, Stephanie Horton, Annie Runyon, and Joanne St. Clair. We met at 9:30 a.m. at my Sandhills house near Hoffman and visited a variety of ephemeral wetlands (seven total) within the longleaf pine ecosystem in Scotland and Hoke counties. Sites ranged from large to small, from artificial borrow pits to clay-based Carolina Bays, and from completely dry to too-deep-for-hip-waders—well illustrating the nature of ephemeral wetlands. We turned up a total of 11 amphibian species (about four of them obligate ephemeral wetland breeders, and a few others heavily dependent upon ephemeral wetlands). We also turned up four lizard species, and saw three fox squirrels (a lifer for some trip participants) as well as many interesting plants, birds, and invertebrates. We made a few brief detours to look at a pitcher plant seep, radio-track a coachwhip, and visit the world champion turkey oak. The weather was beautiful—mostly sunny and 70s°F. We ended the enjoyable day with dinner in a Mexican restaurant in Aberdeen, and most folks headed back toward Raleigh at around 9:00 p.m. A good time was had by all, and everyone learned something. The group at “Antioch Bay,” a clay-based Carolina bay owned by The Nature Conservancy. Clay-based bays are rich in rare plant and animal species. Photo by Jeff Beane. A quick side stop to visit the World Champion Turkey Oak (Quercus laevis) along NC 211 in Moore County. Photo by Jeff Beane. “Seventeen Frog Pond” on Sandhills Game Lands is one of the highest-quality ephemeral wetlands remaining in the Sandhills region, and a stronghold for several rare and declining species. Photo by Jeff Beane. Once abundant in southeastern NC, the Southern Chorus Frog (Pseudacris nigrita) has declined in the past few decades. This species depends on ephemeral wetlands for breeding. Photo by Jeff Beane. More often seen than heard, the Spring Peeper (Pseudacris crucifer) is common throughout North Carolina. Although it can breed in some permanent waters, it prefers ephemeral wetlands. This Mud Salamander (Pseudotriton montanus), was the one amphibian species we encountered that does not use ephemeral ponds. It breeds in small streams and mucky seeps, and we found it in a pitcher plant seep. Photo by Jeff Beane. This is a final note from Finca Esperanza Verde, in the north central highlands of Nicaragua. I have included here a mix of birds we see on our excursions to this reserve and ecolodge, my home away from home. Some of the species shown are tropical residents which remind me of birds back home. Others are indeed migrants that bred back in the U.S. or Canada sometime last year and flew here for half a year. Others are just notable tropic-colorific. I hope you enjoy the images below and more so, I hope you get the chance to visit a tropical forest some day. is in the same genus. We found a pair investigating a cavity and according to one of our local guides, they are beginning to breed now. Instead of offering suet, lodges here offer bananas to any interested birds. Pale-billed Woodpecker – this species is in the same genus as the Ivory-billed Woodpecker. And this one will make a “double knock” bill-strike-on-wood that is similar to that described for the Ivory-bill. Vanessa found one at a nest cavity, apparently feeding young. We know little about the life history of this species in Nicaragua. The Costa Rica field guide indicates this one finishes nesting in late December so perhaps up here, a little further north, they finish in January. Black-cheeked woodpecker – this species is in the same genus as our Red-bellied Woodpecker. They are normally found just east of here, at lower elevations. The property at this site is between 1000-1200 meters and this woodpecker is mostly below 1000m. But we see numerous “Caribbean slope” species up here – presumably due to the local geography. The sound of this woodpecker reminds me of the Red-bellied. except when I can hold it very still……. The Spotted Woodcreeper in the photo shows the tail tips very well, along with an oversized bill. Lesson’s (formerly Blue-crowned) Motmot – This is one of a few species of Motmot’s found in the humid forests, where we are working. The national bird of Nicaragua is a dry forest species called Turquoise-browed Motmot, and I have also included an image of that species. The Motmot’s are another new world tropical group of birds. They nest in cavities dug into mud banks. No one seems to know for sure where the word Motmot comes from, although I have read at least one interesting note about this. I just can’t remember where I read it, sorry. For now, enjoy the photos. Bushy-crested Jay – the tropics is full of some fun-looking jays. In addition, some clearly carry on the black and blue theme of a jay. This species has a rather small range – it is found from Guatemala to No. Nicaragua. I recently found a family of them just off the west edge of the Finca property which represents about the southernmost sighting for this species and what is essentially the first for the Finca. As you can see, a jay is a jay anywhere you go. group of birds. Males gather at leks to sing and dance and carry on, to try and attract a mate. You can search the Internet for some very amusing videos. Here is one of 4 species we find at the Finca property and this is one Olivia captured in a mist net, while trying to lure in a Golden-winged and/or a Brewster’s Warbler (we found both warblers occupying the same area). Rufous-browed Peppershrike/Yellow-throated Vireo – The Peppershrike is essentially a tropical vireo. At our site we get this species plus a couple neotropical migrants, the Blue-headed (rare) and the Yellow-throated shown here. Warblers – here, the most common warblers are some neotropical migrants: Chestnut-sided, Wilson’s, Tennessee, and Black-throated green; and many Golden-wings. This Tennessee Warbler is proof enough that one man’s trash is another bird’s treasure. Both coffee and Chestnut-sided’s migrate to the U.S. at some point. And then, we also find some resident warbler species, and this Rufous-capped Warbler is one of my favorites. Common Pauraque – this is one of many nightjar species found in the tropics. It’s a cross between our familiar Whippoorwill and Chuck-wills-widow although more like the former to me. Fortunately, we seem to be able to find at least one each trip. Olivia Merritt photographed this one. There are ~340 species of hummingbirds. Species diversity peaks in Colombia (~150), but Ecuador and Peru are not far behind. While Nicaragua has many fewer, it’s nice that 10 species of hummingbirds visit the feeders at this lodge. Some have only been seen at the feeders a few times over the past 7 years or so. The Crowned Woodnymph is a species more commonly found at lower elevations on the east/Caribbean slope – but a few individuals are regular in the forests and at the feeders. is the White-bellied Emerald. It looks like a female Ruby-throated. This individual has been visiting the feeders for almost a year. But up until now, we almost never saw it on site. I have captured 3 in 20 mornings of mist-netting, over a 10-year span. We don’t really know much about how it makes a living, at least, not in Nicaragua. The Violet Sabrewing is named for the shape of the outer flight feathers, easily seen here. And the Rufous-tailed Hummingbird is, well, aptly named. Note the outer flight feathers of this Sabrewing. And then here’s one that Vanessa spotted one drizzly afternoon, as the rest of us were looking in the other direction. I won’t print her initial reaction – but it got my attention. And I’m glad, because it was a new species to our list for this property (after some 20 trips) – called the White-necked Jacobin. It is another one that occurs mostly at lower elevations – we’re pretty much at the upper limit for this species, at the Finca. Vanessa Merritt regained enough composure to capture a nice memory. Tanagers. We love our tanagers in North Carolina, and for good reason. Now, it seems, a tanager is not a tanager. That is, who is related to whom has changed with new genetic studies. In the meantime, one can visit the tropics and find some real jewels in the real tanager cohort. Included here are a few examples. Crimson-collared and Passerini’s tanagers are closely related and spend much of their time in the understory and along forest edges. The Golden-hooded Tanager is an example of the genus Tangara – a group of spectacularly colored birds that reaches its colorific peak in the eastern Andean cloud forests. The colors of this Golden-hooded Tanager are more electric in the sunlight…..
Summer Tanager – the Central American forests are full of migratory birds. This is a very familiar species to us all, although you may not have realized how much it loves bananas. found throughout Central and South America. In spite of what they represent, I find them rather adorable and I have to give them credit for being so adaptable. So, I couldn’t help but snap a few images when I found a small group of them just over the mountain in the small town of San Ramon. Who knows, these may be the only pictures of House Sparrow from Nicaragua……… here’s one. those “parts” include a bedroom or kitchen. Here is one of the cutest little rodents around, trying to make a home behind a hanging over Vanessa’s bed. But this is only after it failed to finish a nest in her binocular case, and after chewing up one of her shirts for bedding material. In spite of these pesky events, I still find it mighty adorable – more so because it is in their room and not mine (it seems to come back each night……). Spiders – no surprise, this area is full of them. It’s been fun to see some that are familiar, like this Aranea species – very similar to the one that we find in lovely webs on our front porches in late summer/fall. Another species both here and back home is this Orchard Spider. One this is also familiar, but for a different reason, is this Tarantula species. This one was climbing a post in the dining lodge (outdoor eating area). It’s been cold at night here, in January, and I wish I had more clothes like what this guy is wearing. Three-toed Sloth – one can never get enough sloth pictures.